Have a massive new fashion crush on the young Antwerp-trained designer Haider Ackermann. Holy crow can this man cut, wrap and fold. 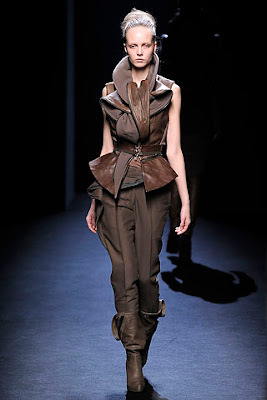 His autumn 2010's line is here; I'm particularly taken with his ability to craft leather. This is goth for grownups, a dark, sinuous style that foresakes the ever-so-tiresome buckles, studs, and strapwork that have informed so-called avant-garde style for oh, twenty years now, for a far more organic and, to my eye, utterly more sensual use of the material. In his hands, the leather, with its tendrils and furls, morphs between fauna and flora, all the while retaining its animal qualities of sheathing, suppleness, warmth. Fleurs du mal that make you want to indulge . . . but I'm not prepared to drop the several thousands necessary to outfit myself in an Ackermann wardrobe, as alluring as the idea might be. Instead, I'm thinking about how to replicate his use of leather in a more modest way. 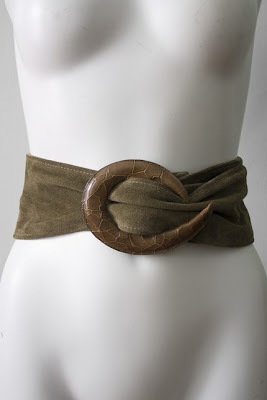 One way to do so would be to turn to the wide sash leather belts that were so popular in the eighties, and wear them tone-on-tone at the waist, or belted across a shoulder, bandolier style, or--if it's not too wide--looped several times around the neck like a scarf. Some nice examples currently available at online outlets are shown below. 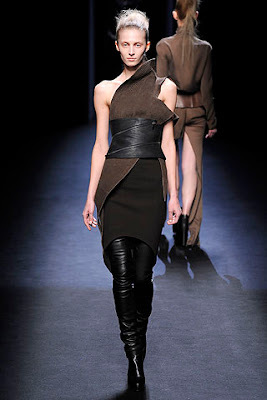 Another possibility might be to layer the leather obi belts that were trendy a year or so ago against a like-colored deluxe material like cashmere or silk, or more leather. Do you have anything in your closet that you can twist and twine, Ackermann style? Have a look and a think . . . plenty of time to play around with ideas before fall. Belts above here and here.